If you are just starting with blockchain investing, you might not realize it has been around a lot longer than one might think. In short, blockchain is an underlying method of the digital currency, bitcoin, which allows for permanent records to be had of the blocked transactions. As described here, “at any time people can see those changes in real time,” giving blockchain a sense of transparency. As it goes with other areas in the world of technology, interest in cryptocurrencies–such as bitcoin–has gained traction over time. According to Seamus Cushley, a PwC expert, over $1.4 billion was invested in blockchain startups in the first nine months of 2016. With interest in the sector growing, here the Investing News Network (INN) breaks down the basics of blockchain investing so that investors can better understand how to step into this space. Before asking “how to invest in blockchain,” it’s important to know what the cryptocurrency is first. As mentioned above, blockchain is technology that enabled the digital currency bitcoin to be safe and transferable. The story more or less starts in 2008, when Satoshi Nakamoto published a paper detailing bitcoin and its ability for two people or companies to transfer payments without the need for a financial institution. To guarantee the payment a blockchain ledger was created, connecting the transactions to a digital signature. This was then verified by complex algorithms allowing the new currency to be trusted. A blockchain begins with a genesis block which births other blocks, or bundles of transactions. The parent block is always the previous block. The ‘tip’ or ‘top’ is the most recently added. Then, the chain becomes fossilized under layers of children and subsequent generations of grandchildren. More specifically, there are a number of examples of different uses of blockchain. Unsurprisingly, banking is one one of them. As noted, Swiss and UK banks have begun testing blockchain as acceleration methods as tasks in the back-end back and settlements. The publication further examples payment or money transfers, uses in cybersecurity, networking and the internet of things, and online music as areas that have begun implementing blockchain. As the technology continues to grow there will be many opportunities for investors. There will be growth from banks and financial institutions that are leveraging the technology successfully. Blockchain is not a physical asset you can purchase but you can buy stock in fast growing public companies who are selling solutions leveraging blockchain technology. To that end, there are a variety of ways for investors who are looking to the answer on how to invest in blockchain, detailed below. 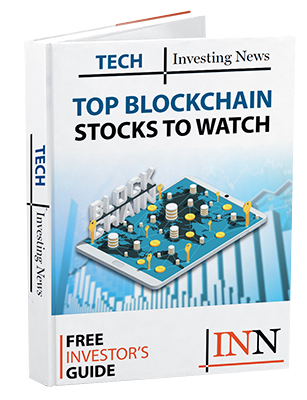 Investing in stocks is the obvious place to start when thinking of “how to start blockchain investing.” While the list of blockchain stocks is relatively short, there are at least several for investors to choose from. While it may not be an immediate choice for blockchain investing, crowdfunding platforms are an attractive way for investors to jump into blockchain investing. As Ameer Rosic, CEO of Blockgeeks describes, crowdfunding is an easy way for innovative projects to obtain money. This is where blockchain steps in. Rosic states blockchain crowdfunding allows startup companies to come up with their own digital currencies to sell. Putting it simply, the increase in demand from companies who are putting blockchain at the heart of their operations and consumers demanding the faster and cheaper services blockchain enables continues to drive growth of the sector and, in turn, more opportunities for how to invest in blockchain. Looking ahead, blockchain’s future outlook is certainly a bright one. As research conducted by Market and Markets suggests, the blockchain market is expected to be worth $2.3 billion by 2021, representing a compound annual growth rate of 61.5 percent between 2016 and then. Another research firm, Grand View Research, suggests the market will grow to $7.74 billion by 2024, citing the financial sector continuing to adapt new technologies–and healthcare, for that matter–fuelling that growth. That said, in 2017 it’s expected that at least 15 percent of banks will adapt blockchain technologies, with that number increasing to 66 percent by 2020. In short, it’s clear to see that the cryptocurrency market is here for the long-haul, which should ease the minds of those who have been wondering on how to invest in blockchain.